13 posts categorized "Book Reviews"
I am finally getting around to writing about the books I’ve been reading. One of the most recent books I read is called My Hitch In Hell: The Bataan Death March by Lester Tenney. If you know anything about World War II history, you will know that this is going to be a harrowing and difficult book to read. It was, but it was also very triumphant. The author was a participant in The Bataan Death March and eventually a prisoner of war for 3 and a half years in the Philippine Islands during World War II. Never did he imagine upon enlisting in the Army that this would be the hand dealt to him. This story was very interesting to me for the history, but also for the personal story. I had one grandfather that served in the Pacific Theater of war during World War II, and another who served in Europe. Sammy also had the same, but he also had a great-uncle who was a death-march participant and also lived as a POW for some time. He is no longer living, but reading this account gives you a window into what he might have suffered during the war. I have actually managed to find Sammy's uncle's name in some internet listings of the various POW camps and known march participants. I really enjoyed this novel. The author had a drive to stay alive and return home, and he constantly stated that if he just set short-term goals for himself, he could make it. For instance, on the march, he would tell himself that his goal was to make it to that tree up there with the gnarled stump, and then he could worry about making it to the next point. He witnessed atrocities that even the most imaginative could not dream up. While reading, I would think that there wasn't possibly something worse that the Japanese soldiers could do. It just couldn't be possible that they could commit a more barbaric and atrocious act, but then they did. It was truly unbelievable, and lets us realize what heroes these prisoners of war truly were. I highly recommend anyone read this book. It gives a great insight to a place and time that many don't read much about or know much about. It is wonderful that the author decided to write this novel because so many of the survivors did not and will not ever tell their stories. I give it 4 stars out of 5 on my book rating scale. My next book, and the most recent that I completed was The Golden Willow by Harry Bernstein. It is the third novel after The Invisible Wall and The Dream. The Golden Willow is a continuation of his life, past and present, with the love of his life, Ruby. The reason for the title you will have to discover if you so choose to read the series of books. There is not a vast amount to say about this book except that it was a good read and a good continuation of the previous novels. After The Dream, I definitely wanted more! The Golden Willow is a portrait of his endearing love for his wife and the good times they shared together. The novel also tells the story of how he finally began to write his first novel, The Invisible Wall, and how it finally became a reality in print. It was not quite as striking and wonderful as the previous two, but it was endearing and delightful. I give it 3 out of 5 stars on my book rating scale. Well, I finished another couple of books! Thank you road trip to the ranch. I always read in the car and get a book or two completed. The first most recent book I read was Confessions of a Shopaholic. I wanted a "chick book" that wasn't intense or too difficult. This book proved to be just the ticket. The one thing heading into this book that I didn't know was that the "shopaholic" is British. This is a very, very English novel with lots of "Brit speak." It was not difficult to read in the least, and it was light and clever. The main character's shopping obsession and antics are somewhat unbelievable, but you continue to read just to see how out of reality she will get. Overall, it was a decent, easy read with some laughs. It's good "beach" reading or when you really want something to read that you don't have to get too involved in. I give this book 3 out of 5 stars on my book rating scale. The second book I read on our weekend at the ranch was The Dream. You may remember the author, Harry Bernstein, from a previous review of The Invisible Wall. The Dream is the sequel. And what a sequel! I might have mentioned that the author was NINETY-SIX when The Invisible Wall was published. The Dream was published this year, and he is now NINETY-NINE. Can you believe it? There is actually a third novel that was just released called The Golden Willow and I can't wait to get that one from my mom. I'm astonished. This novel was a great, great continuation of The Invisible Wall. I absolutely wanted to know about the continuing events, triumphs, and struggles in Harry's family and I was not disappointed at all. It fills in a lot of missing pieces as it follows his family's journey out of their English mill town and into America. You can likely predict that there will be hardships, and there are. Many things are revealed in this book that contribute to Harry's family's misery. I became absorbed in the story and felt sincere pity that their life couldn't have been better. I absolutely love Harry's story. I can't get enough. I give this book 4 out of 5 stars on my book rating scale. I would recommend anyone read both of Harry's novels - you will love them. Here's another book I read in one day. I read another, The Kite Runner, on the trip up to Colorado last year, and I did the same with this book this year. I read much of this book out loud to Sammy as he drove. It was too compelling to keep it to myself. Along the same lines as the Kite Runner, I began reading this book because I had heard of it. I didn't know at all what it was about except for the cover description. The novel, in a nutshell, is about a man who grew up in Louisiana during the Civil Rights Era and a man who grew up in Texas and eventually became a very wealthy art dealer. Their paths eventually cross by means of an (as the book's tagline says) "unlikely woman." Their lives were never the same. After reading this book, this is one that everyone should read. Everyone. I am such a better person for having read this story, and you, too, must not miss this. It gripped my heart. Even if you are not much of a reader, just give it a shot or get it on audio. Reading a story of such servants of God was humbling for me. I continue today (and I read the book 4 days ago) to connect the theme of this book to verses that keep popping in my head, such as Phillippians 2:8, "...and being found in appearance as a man, he humbled himself and became obedient to death— even death on a cross!" Christ died painfully and horribly for me, and, after reading this story, I feel more and more as though most of what I do is inherently selfish. To better explain, one of my favorite parts of the book involved a homeless man sitting outside the entire night beside a dumpster praying for his friend. He had nothing. Nothing. Yet he prayed selflessly all night for a friend. Next to a dumpster, no less. Makes you feel a little selfish when you think about what you've prayed for today... "God, help me get to work safe" or "God, please let that check go through today" or "God, please let my week go well." Do you see the theme? The characters in this book really epitomized the "hands and feet" of God. So, in conclusion, I have thought so much about the events of this book. I encourage you to read it. You will laugh and you will cry, but they are good tears. I had Sammy very teary-eyed listening, and he said several times, "Wow. That's incredible." I give this book a 5 out of 5 stars on my book rating scale. Yes, I've done it again! I've read two books before I managed to get my review written. I guess I feel like I need some time to let a book "sink in" before I write about it. The first book in this 2-for-1 review took me a while to get done, simply because I was darned busy. The second, however, I read in one day. On the way back from Midland, I read all but about 20 pages. When we got home and unpacked that evening, I sat down to read the rest. Couldn't put it down! I picked up this book on a total whim at Target. I walked past the book section and did not have book-buying in mind. For some reason, it jumped out at my line of vision and I picked it up. The review quotes on the back said that it "invited comparison to Angela's Ashes." That was all it took for me to buy it - Angela's Ashes is one of my all-time favorite memoirs, and my favorite genre is the memoir. The book's setting lies in World War I-era England on a street where Jews and Christians live, only they live on opposite sides of the street. The story centers around the author as a child, his family, and their many struggles, heartaches, disappointments, and triumphs (few they were) in the midst of an ever-present "invisible wall" dividing a street of equally prejudiced Christian and Jewish population. The tag-line reads "A love story that broke barriers." The barrier of the invisible wall, in my opinion, gets cracked, and by the novel's end, we can see light through the cracks. The cracks do not come without heartache and disappointment, however. World War I tears the street apart, and family struggles crush hopes and dreams. All in all, the novel was touching and very memorable. Each character unfolds through the story and sticks to your heart. I thoroughly enjoyed it and give it 4 out of 5 stars on my book rating scale. It would have received a 5-star rating, but I can't help draw comparisons to Angela's Ashes, and while it was good, it was not at quite the heights of Angela's Ashes. Side note: The author wrote this novel at the age of 93! He is now 96 and working on his third novel! That in itself is totally amazing. I first came to know about this novel because of the movie publicity. The movie looked interesting, and being the stickler I am, I wanted to try and read the book before seeing the movie. So, I read it in one day. What a great book. The story of a young white girl searching for love and acceptance in the racially-divided south of the 1960's is so many things. Many people have described the story to me as "heartwarming," but for some reason, that just doesn't fully cover it, in my opinion. It is much more. The writer's style is mesmerizing. The way she writes the main character Lily's thoughts and fantasies about love, acceptance, happiness, and sadness simply floats into your mind and heart. I got so caught up in this story with all the emotion spilling out of the main character. "... some things don't matter much. Like the color of a house. How big is that in the overall scheme of life? But lifting a person's heart--now, that matters. The whole problem with people is ... they know what matters, but they don't choose it... The hardest thing on earth is choosing what matters." "It was the in-between time, before day leaves and night comes, a time I've never been partial to because of the sadness that lingers in the space between going and coming." I loved this book and highly recommend it. I still have it lingering in my mind and am really looking forward to see how the movie was done. I give it 5 out of 5 stars on my book rating scale. Two book reviews for the price of one! I completely forgot that I did not post a review for the recently read Marley and Me by John Grogan. So, I will review it first, and then I will review my latest read, Alas, Babylon by Pat Frank. The tag-line, as you can see, is "life and love with the world's worst dog." While this could be true, it is highly debatable to me, since I'm quite sure at least one of my family's dogs growing up hold that record fast and sound. This was an easy-reading book that followed a man and his wife from early married life into getting their first dog together. If nothing else, this was a book I could firmly relate to! And were there ever moments in this book I could relate to! The author describes how he praised his new puppy's job of pooping outside as if he had "just brought home the winning Florida Lottery Ticket." I laughed and laughed because how many times have I said, "Good boy! Good boy!" in that ooey-gooey voice out in the backyard to praise a ...ahem... job... well done. However, as all good things must come to an end, you know going into this book that alas, someday, Marley is going to grow old. If you can't handle sobbing through about 5 pages of this book, it isn't a good read for you! Even knowing that, though, I would not take back the read - what a joy and richness Marley brought to his owners' lives. This book is touching, funny, and an all-around joy to read - Lots of laughs, groans, and surprises. I highly recommend it and give it 4 out of 5 stars on my book rating scale. My mom gave me this book sometime ago and I have finally gotten around to reading it. The reason she gave it to me is because it is on many reading lists and many high schools list it in their required reading. It is essentially a "modern classic." Published in 1959, the simple synopsis given on sites such as Amazon.com is "The classic apocalyptic novel that stunned the nation with its vivid portrayal of a small town's survival after nuclear holocaust devastates the country." I was definitely intrigued with the subject, if not a little frightened by the subject matter. This novel was one of the first novels dealing with the nuclear age, and I am sure it made a lot of readers nervous. It was definitely worrisome and troubling to read the real effects of a nuclear holocaust. This novel centers on a small town in Florida that escapes the worst effects of the attack and deals with the relationships built among the people and tells how they come to survive. Parts of the novel are chilling, parts are very triumphant. It causes you to realize every minute thing we take for granted. Overall, this book had me hooked to the end. I wanted to know how it would end, and read fervently for the last page. I think it is important for people my age to realize that this fear was very real in the era the book was set. I know that I don't truly appreciate what kind of a "time" that was. So, I highly recommend the book and I am sure you will be hooked for the ending as I was. I give it a 4 out of 5 on my book rating scale. Well, I finally got around to reading Khaled Hosseini's second novel, A Thousand Splendid Suns. I remember my mom telling me that I might like this book more than The Kite Runner. I cannot say that I liked it more, but it was equally gripping and good. It is pretty easy to tell that a novel is fabulous when you pick it up on a Saturday evening, read 4 chapters, then pick it up again on Sunday to finish. I began this novel with what I already knew from The Kite Runner, and while that did not spoil this novel, it did not allow it to have the same heavy emotional impact. I guess I was expecting the intensity. There is something very melodic, almost soothing about the author's writing style that allows me to have an intense desire to finish the book and to know how it will all end. I kept telling myself, "Just one more chapter." This same writing style allows me to read it quickly and with a purpose. It is intense, while keeping a slight veil of mystery. It is matter-of-fact and swift. Needless to say, I thoroughly love his writing style. The only thing I will reveal about content is this: It is set in the same time frame as The Kite Runner - the novel follows Afghanistan's many years of upheaval, oppression, and changing regimes. Second, this novel focuses on the lives of two women. They endure heartache but the point is that they endure. How they endure in such a harsh culture that treats women as if they were cattle, I truly don't know, and it is painful to realize that while this novel is fiction, these sufferings are real. I will do what I did for my review of The Kite Runner. I will share a list of themes and/or emotions I encountered in A Thousand Splendid Suns. It will not surprise you that many of those themes will be the same. This book definitely receives 5 out of 5 stars on my rating scale. This book should be read, for it weaves a tale through a rarely-seen window of modern Afghanistan and women's sufferings therein. Well, I did finally finish another book, and like book review #6, it was another audio book. This one took me a bit longer to get through, because it was unabridged and 13 discs long. LONG. My friend from work loaned me the audiobook, and I dutifully listened every day to work and back until I was finished. This novel will probably conclude my fascination of late with the FLDS, it will probably be a while before I pick up another. I'm really wanting to pick up some fiction for a while! This book was, like the previous one about the same subject, interesting, harrowing, and triumphant. This story had much more detail than the last, and by the end of the book, even went as far into the past as a couple of months ago, which was good. I enjoyed hearing the author's perspective on all of the things we've been hearing about second-hand in the media. The author, if you were not aware, eventually became the star witness in the trial that convicted Warren Jeffs, a man you have most likely heard about in the news. 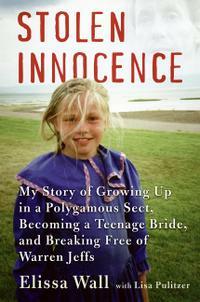 Her story, Stolen Innocence, details her childhood, teen marriage, eventual escape from the religion, and recent time in court testifying for the prosecution against Warren Jeffs. I thoroughly enjoyed the story, all the detail, and want to give this novel a solid 4 out of 5 stars on my rating scale. Well, I finally finished another book, and I must say that this one has been the easiest to finish in a while because it was an audiobook. I'm thinking I need to do this more often! I really enjoy putting an audiobook on my iPod and listening on my drive to work and back. This book was a good read. Very informative. I knew a bit about the subject matter from reading "Under The Banner of Heaven" by John Krakauer, and I have been fascinated with the topic of Fundamentalist Mormons ever since. Since I knew about the subject of the book, I knew what to expect. I knew there would be uncomfortable, even shocking details. It was good to hear those details from an insider, like Carolyn, versus an outsider like John Krakauer. This story has turned quite high-profile, and has been very prominent in the news lately due to the arrest and conviction of Warren Jeffs. This book did not disappoint at all, I enjoyed the layout of the story thoroughly. This book and others of the same topic are must-reads, in my opinion. As Carolyn said in the book, no one knows about the abuse, struggles, fear, and despair that occurs behind closed doors of FLDS families, and they should. The women in these situations need to know that they can escape, and those on the outside should be informed so they can seek help. She did not hesitate to call the FLDS a cult, and so many women (and men) are brainwashed and therefore trapped. So, all in all, a great read. Very quick and easy. I highly recommend it, and I rate this book a 4 out of 5 on my rating scale. You know, I might actually be able to make my 2008 book-reading goal! So far, so good. I read this one pretty quickly after The Kite Runner, so I need to keep up my momentum. It does help my reading speed that I saw this movie before reading the book. It also helps that I really love memoirs. This book turned out to be an enjoyable and easy read for me. This book is the story of a mother of ten children who essentially keeps their family afloat by contesting. She is witty and positive and never gives up. She obviously has amazing grit and determination to do what she does while living life with an alcoholic husband who doesn't do much fathering. Written by the "prize winner's" daughter, the book reads very quickly, is very easy to follow, and is continually upbeat and fun. With every trial, setback, and mishap the family encounters, another contest entry comes through. You will enjoy the journey this family takes as their children grow, mature, and eventually live lives of their own away from Defiance, Ohio. While the days of contesting as they were then have ended, the legend I am sure this woman holds lives on. I rate this book a 4 out of 5 on my rating scale. Welcome to my fourth book review! I am excited about this review - I can begin by saying this was the best book I've read in quite a while. So good that I'm worried I'll be disappointed in the next book I read if it isn't as good. My review for this one will be simple and very brief. I am afraid if I write a really big review, I will give away too much and keeping mystery behind this book is exactly what made it wonderful for me. To begin, I went into this book knowing nothing. I didn't even know what a "Kite Runner" was. The only thing I read was the newspaper review blurbs on the back of the book and on the first couple of pages. I am so glad this is the way I went in. If I had some idea about the content, I might have had a preconception about the story and that might have minimized the emotions I felt while reading this book. I decided to review this book by making a list. Again, I don't want to give away anything. For my review, here is a list of themes and/or emotions that I encountered in this novel (in no particular order). I rate this book a 5 out of 5 on my rating scale. It was gripping and I read with the intense purpose of having to know how it would end.